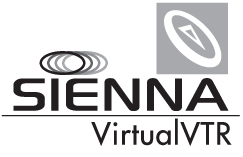 Sienna VirtualVTR provides the QuickTime play-out channels for your media workflow. Supporting all formats of SD and HD QuickTime natively without the need to transcode, VirtualVTR plays original and edited media from your shared storage directly to air, even supporting Quicktime reference movies. VirtualVTR may be controlled using a wide variety of methods including Sony P2 protocol (with Odetics extensions), VDCP, TCP/IP (using Sienna protocol from AutomationX, or the VirtualVTR Remote control application), MMC, USB keyboard or Jog Shuttle controller, GPIs, or timecode chase. All control protocols can be active simultaneously. Multiple VirtualVTR channels interface with AutomationX to allow fully automated multichannel play to air. Pairs of VirtualVTR systems can also be linked in a 'buddy' configuration for redundancy, where the second system automatically chases the first, frame accurately, and in the event of failure of the primary system, the backup system will already be playing back the program in sync, ready for the director (or fail-over monitor) to switch to the backup. VirtualVTR supports a wide variety of codecs including long-GOP formats such as HDV and XDCam HD. In addition to Quicktime video, VirtualVTR can playback animation sequences and still frames in various formats, including fill and key motion graphics from a single VirtualVTR channel. 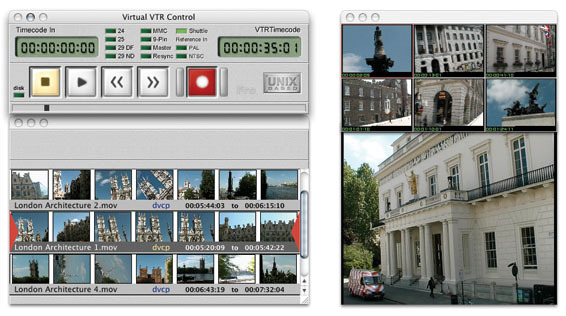 VirtualVTR can also be used for basic subclip logging, using a highly responsive USB Jog shuttle controller. As an alternative to using a full blown craft edit system, journalists can benefit from VirtualVTR’s ultra straightforward interface to search for Sienna Media objects, review and mark subclips, then deliver these clips to OriginOne with added metadata. The Sienna Subclips are immediately made available (with proxy video and a thumbnail) right inside the News System, via the MediaSearch web interface and inside Final Cut Pro via StoryCut. VirtualVTR is a mature and powerful system, providing an efficient, modular ‘Play to Air’ infrastructure.